With my extensive Information Technology background, I used to volunteer as a Photo Finish timer or reader. The days were long, and the number of interruptions were tremendous from all the athletes peeking over your shoulder looking for their official electronic time! Who can blame them? Gone are the days of hand times at major track meets, and converting HT to FAT, but they still exist at smaller low key All-Comers meets. This article is by far the best explanation of camera positioning, camera settings, and most importantly, How to Read a Finish Line Photo! Thanks to lain Hunter and Phillip Henson for this article. A very “timely” article for officials who have to sort out race placings by reading automatic timing photos. The authors also discuss proper camera placement and settings. The days of timing races with a stopwatch, especially sprint races, are long gone! In 2006, when Asafa Powell and Justin Gatlin each ran 9.77 in the 100m dash in different locations, athletes, coaches and fans were discussing the thousandths of a second between the runners. Unless we have certain essential parameters in place, it can be risky to consider comparing results to the hundredth, let alone to within thousandths of a second, even in the same meet. To compare results to within thousandths of a second among different meets is even more difficult. To be able to make appropriate comparisons and to provide timing accuracy, the timing system must be optimized and the timing evaluator must be experienced and competent The timing equipment must be correctly aligned, zoomed, focused and have adequate lighting. The operator evaluating the image must have an understanding of both the rules of the sport and of human anatomy. This article is designed to assist timing officials in creating optimum conditions for quick and accurate results. The significant physical factors include camera alignment, camera settings and sufficient ambiÂ­ent light. The operator must have a good grasp of the rules, with an understanding of the definition of when an athlete has finished a race. This discussion can also provide insight to athletes about how the positioning of their body at the finÂ­ish can gain precious thousandths of a second. We do not attempt to establish or reinterpret rules, but rather attempt to help us all increase our understanding of the signifiÂ­cant factors that apply to reading finishes accurately. An additional observation is that we should see an increased consistency between different readers. The IAAF rule book states “The athletes shall be placed in the order in which any part of their bodies (i.e. torso, as distinguished from the head, neck, arms, legs, hands or feet) reached the vertical plane of the nearer edge of the finish line” (Rule 164, IAAF Rules 2006-2007). Cameras provided by companies such as: Finish Lynx, Seiko, Swatch, or Tissot take a one-pixel wide image of the finish line, typically between 500 and 1000 times per second. As a runner passes through the finish, multiple single vertical line images are taken and placed together to create a picture showing the complete person. Each image, or vertical column of pixels, was taken at a fixed point in time and thus represents a potential finish time. In order to follow the rules provided by the governing bodies, the camera must be directly in line with the front edge of the finish line and exactly perpendicular to the track lanes. Camera height and distance from the track is critical in helping the operator evaluating the image to distinguish between athletes finÂ­ishing at nearly the same time. In Figure 1 the left picture was taken with a camera positioned too low relative to its distance from the track. It makes reading close finishes very difficult. The right picture was taken with a camera positioned farther from the track and at a higher elÂ­evation. The difference is obvious. A good rule of thumb is to place the height of the camera equal to the camera’s horizontal distance away from the track. However, there may still be some finishes that cannot be determined even with a well-positioned camera. Thus, another camera placed on the opposite side of the track will help immeasurably when determining close finishes. Because distance races do not finish in an assigned lane, meet officials will have occasions where they struggle to determine the finÂ­ish order. Figure 2 shows a printout of a camera that was zoomed in to display only lanes 1 through 3. This camera setup allows for a much clearer image of the finishing athletes. Hip numbers are larger and easier to read. While hip numbers may still be covered up or missing, the athletes are much easier to recÂ­ognize when the camera is zoomed in this tightly. A color camera adds an additional benefit to the task of identifying an athlete’s uniform as an aid to identification. The zoomed in camera is a benefit, but does not have a view of outside lanes. Since some athletes may finish outside of the camera’s view, another camera must be used to see all the lanes. READ What if they had a Track Meet and Nobody Cared? Figure 1: Opposite views of the same race. The first image was taken with a camera on a tall tripod, while the second view was on a 20 foot pole about 20 feet from the track. 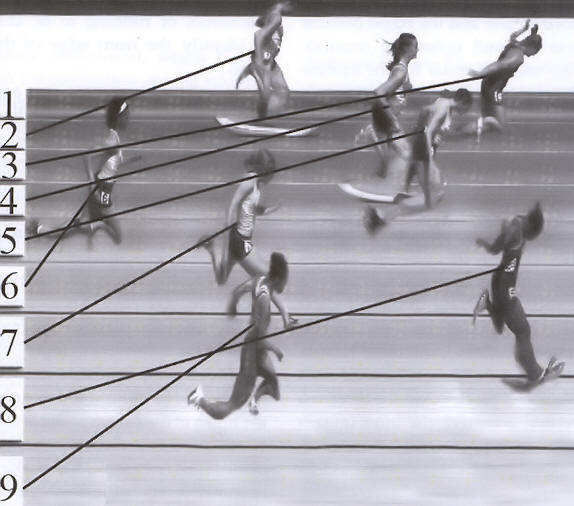 Figure 2: A camera zoomed in to capture distance runners finishing in lanes 1-3. Hip number are much easier to read and athletes become easier to identify since more of the photoreceptors of the camera are being used to generate the image of each athlete. This is the full height of the image. A camera that is zoomed correctly will see either a part or all of the close lane and just above head level of any athlete finishing in the far lane. By zooming a camera in this manner, the user maximizes the number of pixels, creating more useful images. Focusing the camera correctly helps ensure a sharp image with distinct edges for marking an accurate finish. When a camera is placed relatively close to the track, the depth of field (the distance of acceptable focus) may be somewhat limited. A camera that is at least eight feet horizontally from the track is a desirable setup. It allows for a clearer focus on athletes in all lanes. Ideally, a horizontal distance of 10 feet or more should be aimed for when facilities allow. If cameras are placed relatively far from the track, requiring a large amount of zooming in, care should be taken to obtain adequate light. Iris and gain settings can be altered to help obtain an acceptable image using the existing amount of light. When a dark background exists, it is often desirable to place a white-colored material as a backÂ­drop, either on the ground or angled toward the camera on the outside of the far lane. This helps provide a clear difference between athletes and the background. However, when the sun is behind the camera, significant reflection from the sun on the white background may cause the image to become washed out. Throughout the day, adjustments may need to be made when using a white background. The camera’s rate (the number of vertical images [pixels] it takes per second) should be adjusted according to each race. Depending upon the company the cameras are purchased from, different rates might be desirable. 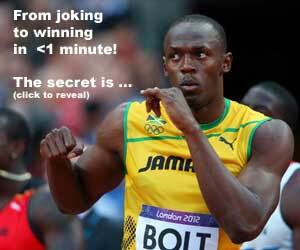 However, it is true with all cameras that a higher rate is appropriate for faster races. One might ask why a higher rate shouldn’t be used all the time. When the rate is too high for certain athletes, they become stretched out horizontally and the edges become less defined (ghosting occurs). The user’s manual for the camera should list appropriate rates for each race. Finally, the direction of the runner relative to the camera is important to specify. Most cameras use three photoreceptors to create the one-pixel-wide image. The camera or software adjusts the timing of each photoreceptor’s display according to the direction of the runner. If the direction setting is incorrect, three offset images appear of the person (one for each photoreceptor). When the direction setting is correct, the three images from each photoreceptor are overlaid with each other creating a clear image. The rulebooks effectively deÂ­scribe the finish, but certain body positions can make it difficult to make a definitive determination. Thus, it is important to gain an understanding of anatomy and the mechanics of running to be able to identify the front edge of the torso. 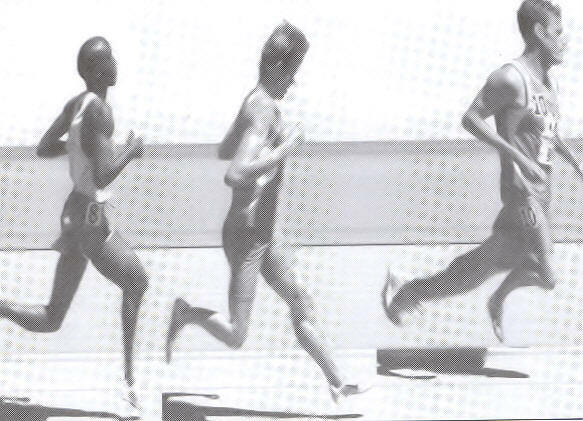 When the chest is the first part of the torso to cross the finish line, the determination of the finish is quite easy (Figure 3a). However, when the shoulder leans in first, the finish is more difficult to sort out (Figure 3b). In this case, the finish should be determined anatomically by envisioning where the acromion process or front edge of the scapula first touches the plane of the front edge of the finish line (Figure 3c). 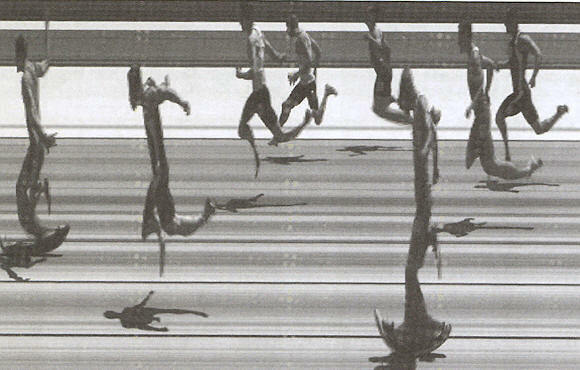 Ideally, an opposite camera view would be utilized to determine the finish of the runner in Figure 3b. However, if that view is either not available or not usable, the marking as shown is where the finish should be applied. Figure 3: Correct marking of finishes. a) The front edge of the torso is easily in view. b) An opposite camera view would help here, but if it is not available, some of the upper arm will be in front of the finish mark. c) If the shoulder is leading the torso, the reader needs to visualize where the acromion process of the scapul is (ignoring the flesh of the arm and shoulder). Another difficulty in reading images can be in determining the correct lane for runners in laned races. Sometimes shadows can be used to help with this issue (Figure 4). When the sun is in line with the lanes, this makes the job much easier. Notice how in Figure 4, the runner in lane two (lane one is closest to the bottom of the image) appears that he may be in the lane three. However, by seeing his shadow directly in lane two, it is clear that lane two is his correct lane. Figure 4: Using shadows to help determine lanes. 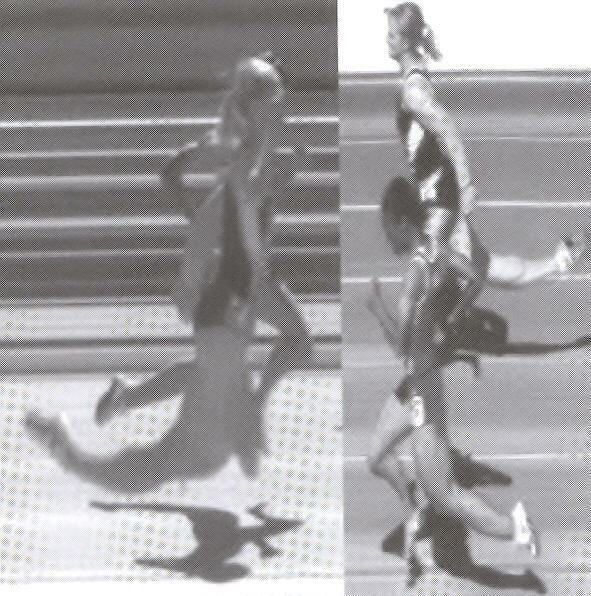 When shadows are not visible, an understanding of how body positioning appears in the finish line images helps the reader to determine the correct lanes (Figure 5). When the runner’s foot lands on the finish line, many pixels of the finish line will display the foot. When this occurs, the foot appears stretched out in the lane making it easier to identify the lane assignÂ­ment, for example, the runner in lane 2 of Figure 5. The runner in lane three is more difficult to assign to a lane. Notice how the body positioning of the runner finishing in lane three has both feet relatively high in the air. Due to the camera angle, it appears that she may be in lane two. Image readers must learn to recognize the position of the runners such as in lanes two, six, and nine of Figure 5 to correctly identify their lane assignments. Figure 5: Determining correct lane assignments. The runners in lanes 3, 6, and 9 appear to be in lanes 2, 5, and 8 unless body positioning is considered. Lane 1 is empty. Through learning the height above ground level based upon body positioning, and being familiar with the position of the camera, a reader can more easily determine lane assignments. One exception is when a runner finishes near the edge of his/her lane rather than through the middle of it. When this occurs, recognizing other finishers in other lanes can be used to narrow down which lane is the correct lane. Fans, athletes, and coaches of track and field have come to expect quick, accurate results. The current technology and facilities makes this possible only when a knowledgeable staff is used. The primary focus must always be upon accurate reading. With the insight discussed here and the benefit of experience, the speed of results can be improved without decreasing accuracy.